THE Save Our Spit Alliance has expressed concerns about the impartiality of the board of the Gold Coast Waterways Authority. Spokesman Dr Steve Gration said his organisation was alarmed the authority could be biased towards a cruise ship terminal because of the personal views of some board members and their links with pro-development groups and Chinese consortiums. "We believe there are contradictions if you look carefully at the makeup of the board," he said. "Our investigations show there is a pattern emerging which seems to compromise the integrity of board members if they do not declare their interests." Dr Gration said board member and Mayor Tom Tate was one of two Gold Coast representatives of the Waterways Authority. We know that his personal and business lawyer is Tony Hickey, who is a spokesman for the ASF China Property Consortium, which has been shortlisted as a possible cruise ship terminal developer," he said. Dr Gration said the alliance was also concerned about the appointment of Raymond James to theGold Coast Waterways Authority board. 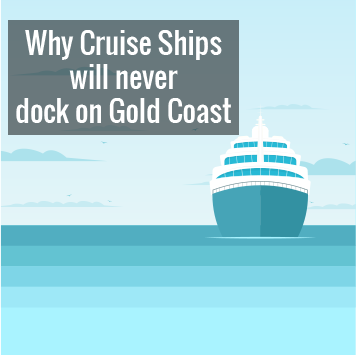 "Mr James is a mining geo-physicist and chief executive officer of Icon Energy, which was a client of Graham Staerk, a registered property development lobbyist and a spokesman for another Chinese consortium shortlisted for the cruise ship plans," he said. 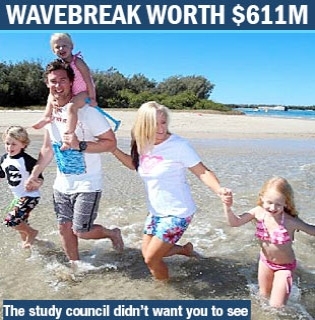 "Mr James has previously articulated his ideas for the development of Wavebreak Island, which is a concern." The spit alliance also questioned the appointment of Martin Winter, chief executive officer of Gold Coast Tourism, which Dr Gration said was dependent on $10 million in annual tourism levy funds from the Gold Coast City Council. "Mr Winter is a supporter of a terminal," he said. Dr Gration said another board member Michael Bartlett was a co-founder of Cruise Down Under, a not-for-profit organisation dedicated to promoting Australia as a cruise ship destination. "Assistant Minister of Transport Steve Minnikin was a manager at property development company Australia,'' he said. THE chairman of the Gold Coast Waterways Authority said the board had discussed the possibility of a cruise ship terminal and it was ready to respond if the State Government decided it should proceed with the major project. Gary Baildon said the Broadwater Marine Project was led by the State Development Department. "The authority is a member of the steering committee and board members were appointed by Transport Minister Scott Emerson,'' he said. Mr Baildon did not comment on specific allegations by Dr Gration that board members were biased towards a cruise ship terminal or alleged links with Chinese consortiums.